Around the blogs (and Web) . . .
Camden Courier Post. In this article a New Jersey-based Italian-American club credits Mary Ann with helping them raise $1,000 that they then donated to a local food bank. It was a nice event and Mary Ann was happy to help. Behind the Burner. Behind the Burner is a fairly new website that offers a glimpse inside the sometimes chaotic culinary world. They posted a Q&A with Mary Ann that's pretty entertaining. Who knew Mary Ann doesn't like liver? WMUR-TV (With Video). Mary Ann appeared on WMUR's "Chronicle" program right before Christmas. We're not sure how long the video will stay up, so check it out now! Books - Cooking: Quick and Easy. 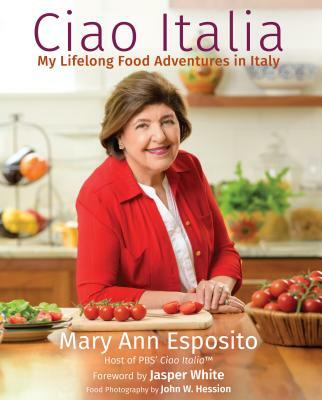 This blog highlights all kinds of cookbooks that feature so-called quick and easy recipes - including Ciao Italia Slow and Easy, Mary Ann's most recent cookbook. Linda Coward Pottery. It's been a while since our last "Around the Blogs" roundup, so this post from Linda Coward from Tulsa, OK is from back around Thanksgiving! No worries, though. The recipe she highlights from Celebrations Italian Style is good anytime! Pictures & Pancakes. Carrie and Andrew feature delicious recipes and great photos to go along with them. They love Mary Ann's Orange Almond Biscotti. Hello Mary Ann. I met you last week in Salem. What a wonderful time my mother and I had. I was wondering if you had the recipe for the almond bicotti that accompanied the panna cotta. Thank you soo much for sharing your recipes!! I cannot find the recipe for Almond Biscotti that uses only 1/2 cup sugar ,oil, lemon zest….along with other ingredients….I watched it on TV and then somehow copied it down but I can't find it….could you tell me how to located it on the Ciao Italian site? thank you so much, Sheila C.